Tissot can be one of Swatch Group’s most surprising brands. Though it has carved itself a niche at the lower end of Swatch’s portfolio, Tissot watches shouldn’t be thought of as cheap. Sure, much of their catalog doesn’t break the bank, but the watches themselves are solid and, depending on the model, chock full of features that allow Tissot to blow away the competition (and that includes brands not even directly competing with Tissot that charge 2x or 3x the price for their wares). A few years back, it was the impressive Ballade, which we covered here. That watch introduced the world to a Swiss-made, COSC-certified chronometer with a silicon balance spring for just $1,000. That’s really, really good. This year’s surprise? Earlier this week, I got to spend some time with the new two-tone Gentleman collection. But you may be asking, what makes this series so special? Let’s dive right in. Introducing the Tissot Gentleman, a watch that doesn’t whisper, but rather screams value. I don’t normally do this, but let’s start with the price, because knowing the price right off the bat will contextualize the specs. List is $1,300. Knowing that, one might assume that the two-tone case is PVD-coated, but it isn’t. That bezel is actually 18kt solid rose gold, which is pretty nuts when one considers the general going rate of other two-tone watches. Then there’s the movement. 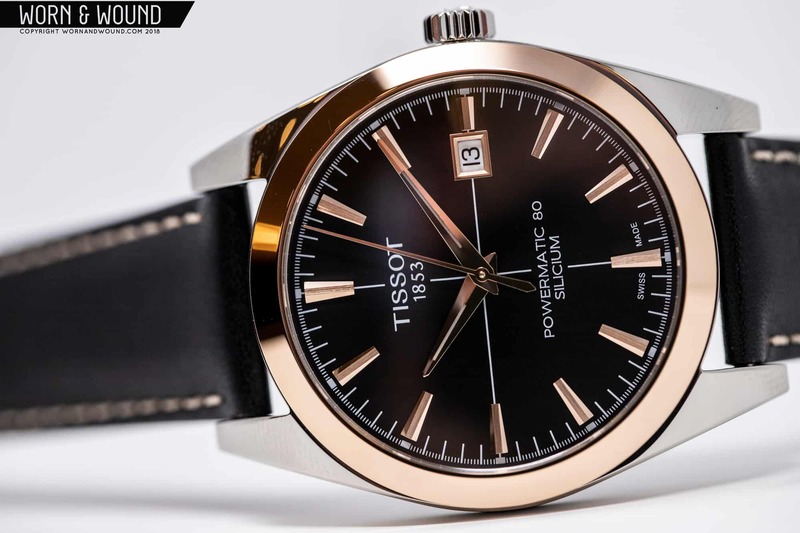 Powering the Gentleman is Tissot’s Powermatic 80, which is a branded C07.111, which in turn is based on the ETA 2824, but with a boosted 80-hour power reserve. But that’s not all. On top of all that, there’s also a silicon hairspring here. So to recap, you’re getting a proven, supercharged movement on top of a solid rose gold two-tone case for not much over $1,000—it’s hard to knock that. Of course, you can spec a watch out to the nines, but it won’t matter if the thing is an eyesore. Thankfully, Tissot didn’t drop the ball here. The design is classic and rather reserved, but it’s far from boring. I really like the cross hairs and the faceted, mixed-finish, applied hour markers. The black dial packs a punch, but the real winner is the champagne dial, which shines up when it catches the light. Even the date window, which shouldn’t work here, does because it feels appropriately integrated into the overall design. The devil’s in the details with the Tissot Gentleman. Note the multi-faceted, mixed texture finish on the indices and the dynamic dial. The case measures 40 millimeters across and 10.64 millimeters thick, so it’s in a sweet spot, size-wise. I’d have loved to see this piece scaled down to 38 millimeters or so, but that’s a personal preference, and as is it still works well on the wrist. I also appreciate that the case is well under 11 millimeters. Overall, I like the sort of blocky take on the case. It reminds me of a UG Polerouter Super I once owned, just scaled up. The lug width is 20 millimeters, which works well with the case diameter, and I suspect this one will be a bit of a strap monster. Rounding out the specs: the case is rated to 5 ATM; the glass up top is sapphire and mineral over the movement, and there’s a subtle application of Super-LumiNova on the hands and dial. The Gentleman is available with a leather strap or with a matching bracelet, but, in my opinion, this one is definitely meant to be paired with leather.